Generally bunker maintenance is divided into two areas: maintaining everything inside the bunker and everything outside the bunker. Although bunkers represent a very small portion of the total golf course playing area, they are an integral part of golf course design and playing strategy. Proper bunker maintenance is essential. During the winter months here at the Home of Golf the greenkeeping team work on rebuilding the bunkers and bring them back into play before the beginning of high season. Between rebuilds we also ensure that they are maintained to the highest possible standard. Generally bunker maintenance is divided into two areas: maintaining everything inside the bunker and everything outside the bunker. Inside the bunkers we work on tasks from strimming, blowing and hand weeding bunker faces to maintaining a proper shape and depth of the sand. Outside the bunker we focus on mowing, topdressing, overseeding, fertilizer application, wetting agent application, hand watering and weed control on bunker tops. 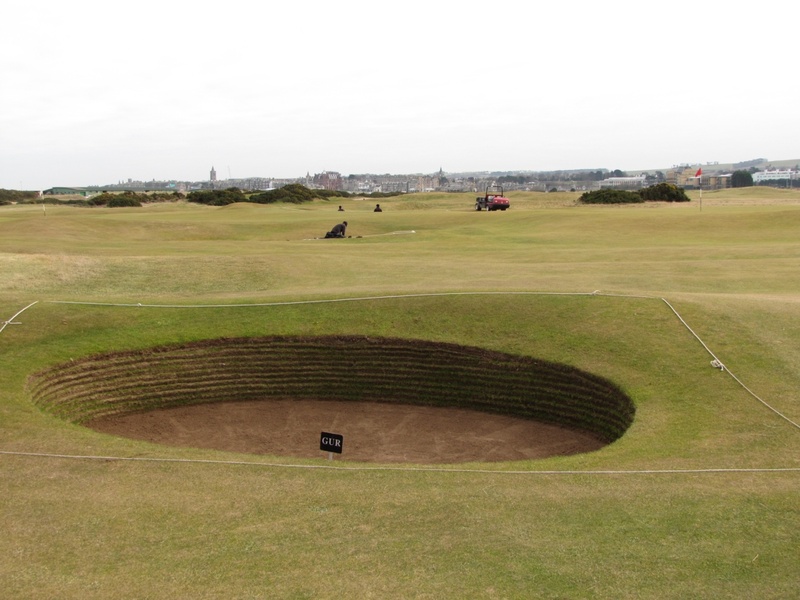 Traditional links bunkers (revetted bunkers) are built from turf sods. As the turf starts to grow on the bunker face it’s necessary to strim the face to keep the grass short and tidy. 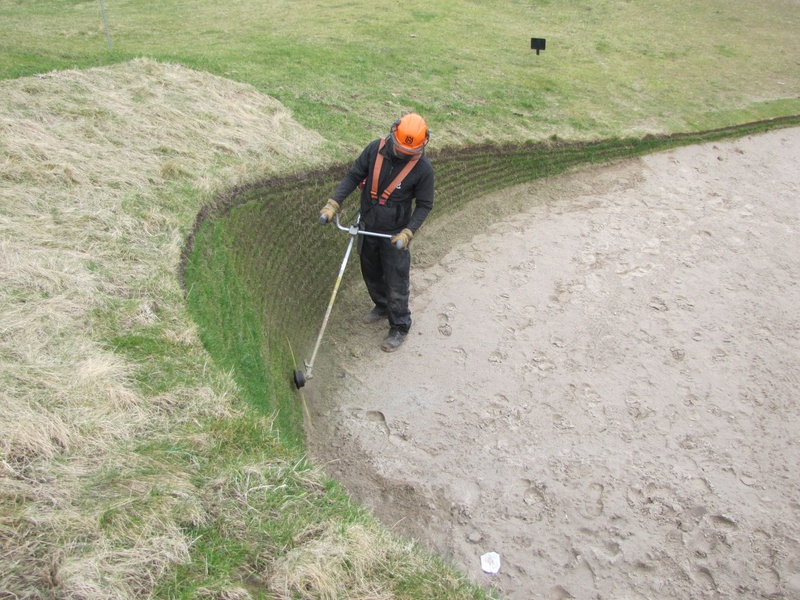 For strimming we change the angle of the strimmer head to follow the steepness of the bunker face. We don’t use the guard and keep the cord slightly longer to minimise turf wall damage. 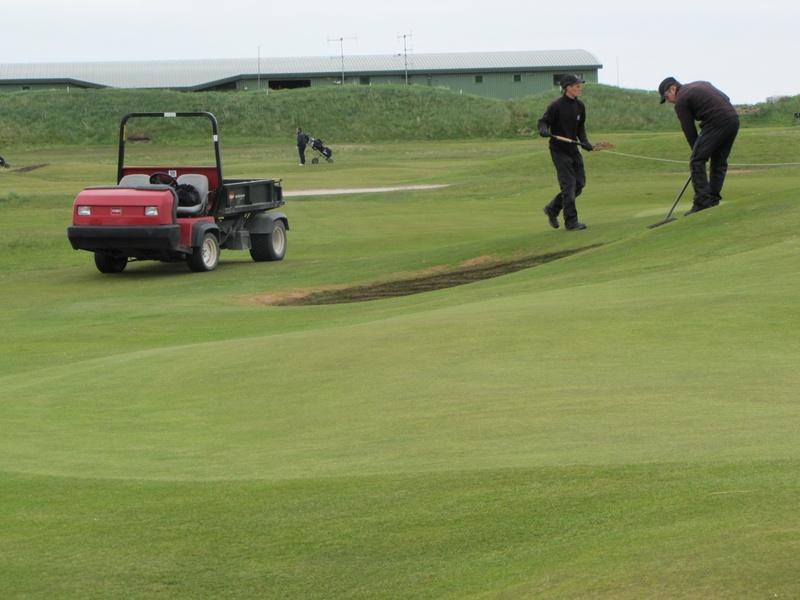 While some courses completely kill the grass on bunker faces, on the Old Course we prefer to keep turf on the faces. It can however be a difficult job as any dead grass patches are swiftly taken over by weeds. Hand weeding is the best method of keeping this under control. 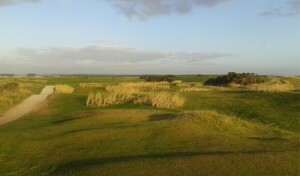 The sand used in our bunkers is taken from the West Sands beach under licence from Marine Scotland. We add the sand to the base at a consistent depth of 50mm. Due to dry and windy conditions or simply golfers playing bunker shots, the sand is always on the move and as a result, it can accumulate on the bunker face. To keep this free from sand we use a blower or traditional bamboo broom. We will also hand water the sand in bunkers to prevent it from moving around too much. Hand watering is similarly effective in helping keep the bunkers in proper bowl shape. This is a hugely important factor as it encourages the golf ball landing in the bunker to roll away from face towards the middle. As I’m sure you all know, this gives the golfer a much better chance of playing a successful bunker shot. Our bunker tops are mowed with TORO 1600 pedestrian mowers at a height of 10mm during high season. 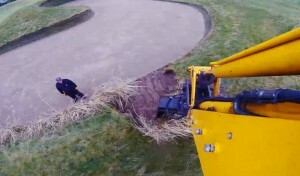 A select few bunker tops are particularly steep and thus require the mower to be supported from inside the bunker by one person, to prevent the mower slipping inside the bunker. 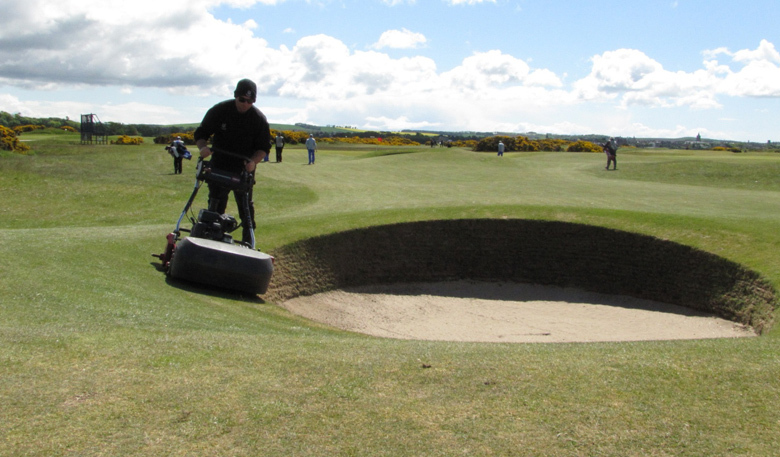 We ensure the bunker tops are topdressed regularly by hand. This helps knit the turf together and fills up all cracks and gaps between turf sods. 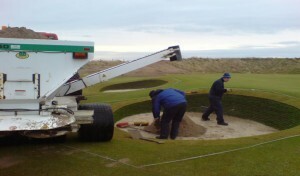 Bunker tops are put under huge strain by heavy traffic (mostly at entrance points) and by the elements. All worn areas are overseeded – this is also essential in controlling the grass sward composition. To create proper grass seed beds (shape and depth) we usually use a rotary hand seeder and grass seeds are brushed in to the holes by a soft brush before being topdressed. Once overseeding has taken place we stimulate the growth of the young grass on the bunker tops by applying fertilizer once a year. A light application contains small amounts of nitrogen and iron. The iron helps to control moss (which is very active on these areas) and also is good for colour. We apply the fertilizer using a push hand spreader on around the bunker. To maintain appropriate moisture levels and allow water penetration through the soil profile a wetting agent application is required. 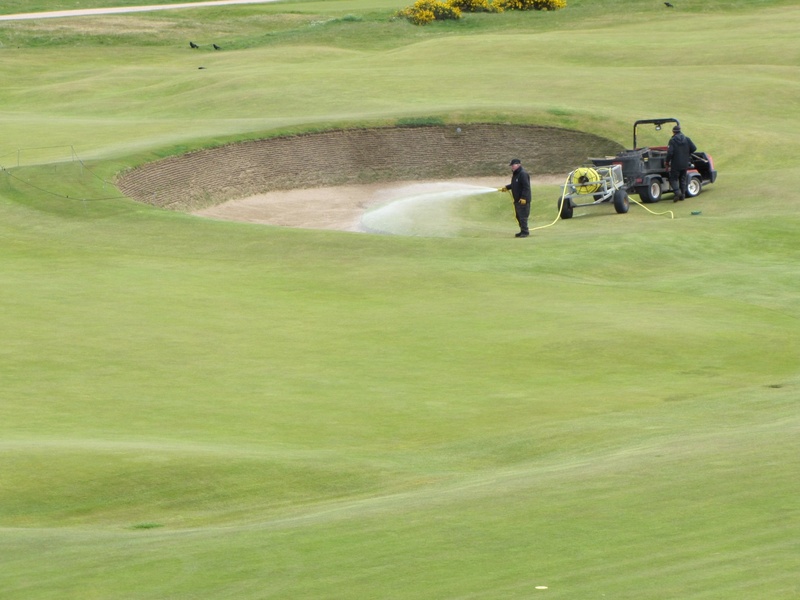 The wetting agent is applied using a hand push sprayer on a monthly basis between April and September. 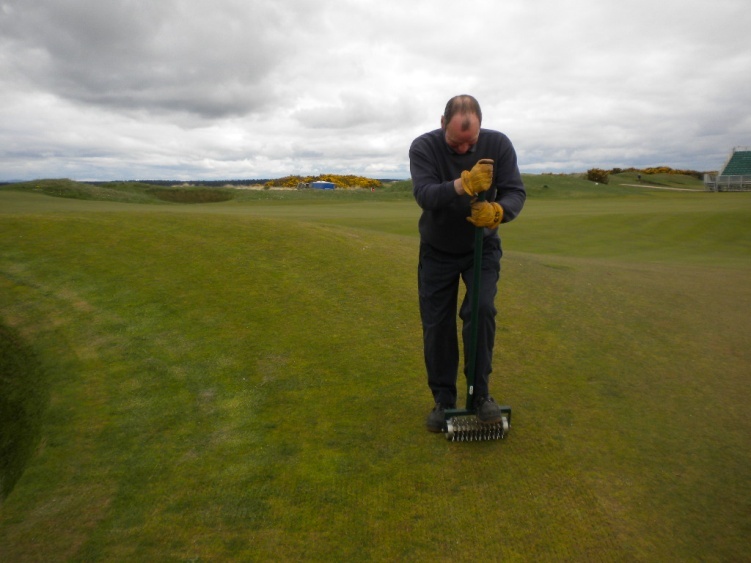 Words by Martin Turna, Greenkeeper – the Old Course. What to do about bunkers?